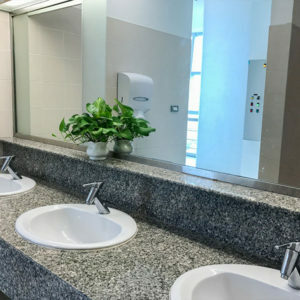 The quality of many professional environments can be judged via the hygiene levels exhibited in the washroom, and an office is no different. A clean washroom is vital for workplace happiness, and we place particular emphasis on ensuring a spotless result. No matter how large your office space, or how many washrooms you have, we are confident we will deliver a five-star service. We have built our stellar reputation on this very fact. Thanks to our many years of experience, we can even offer guidance on your optimum cleaning schedule, so that your office washrooms have that ‘just-cleaned’ look no matter what the time of day. Many elements in a washroom require a deep level of cleaning, and we make sure to cover them all. Our attention to detail guarantees the removal of all grime, before disinfecting to present a spotless space. Every visible aspect must shine to instill a hygienic atmosphere, and our teams will not leave until the washroom glistens. Most of the offices we work in have additional shower facilities, on top of regular washrooms. We make sure that every surface is properly cleaned and polished, as well as scrubbing all toilets and sinks so that there is the highest level of hygiene, no matter where you are. Splashed water will quickly mark any area, so we are sure to wipe every surface dry on each visit. Once we have sanitized all the units, we get to work on the floors; this includes extensive mopping and washing to remove any trace of dirt or bacteria, preserving the pristine presentation of the washroom. Some cleaning tasks are less glamorous than others, and one of those includes cleaning and treating both plugs and drains. Given their position, they are prone to accumulating a higher level of bacteria and hair, so we often have to use specific products and techniques to sanitize the element correctly. When carried out on a regular basis, we avoid unwanted blockages that can lead to more severe complications, if not adequately managed. Washrooms have many awkward to reach spots but thanks to our years of experience, we know them all. From pipes that run just above the floor to door grills that accumulate grease and condensation, these areas all require added attention to make sure they never reach an unhygienic state. A regular, thorough clean is the best way to preserve the sanitary nature of the entire washroom. As with glass, mirrors require careful cleaning and polishing to avoid unnecessary stains. Frequent splashing and build-up of condensation can result in unsightly marks across the glass, however, with the right products, mirrors are quickly returned to their presentable best. As one of the busier areas of the office, washrooms end up with scuffs across surfaces more frequently than one might imagine. Wiping down doors and walls, or sanitizing light switches, is an important task when cleaning an office. These areas can quickly become unmanageable if left unattended for long periods of time. The Sunset Quality Cleaning service revolves around a detailed approach to every task, which extends to how regularly we disinfect floor drains, reducing the risk of unwanted odours. Clients often ignore such jobs and struggle to identify the source a smell. We ensure that no drain has time to become unsanitary, thus, avoiding the risk.